Walking up to Beth’s home on a warm March afternoon in Anchorage, she was already in the backyard watching happy chickens frolicking around her, and a cat in her lap. The run area fencing was open on the far side, and the hens were split between exploring the open yard and scratching under the trees in their fenced run. 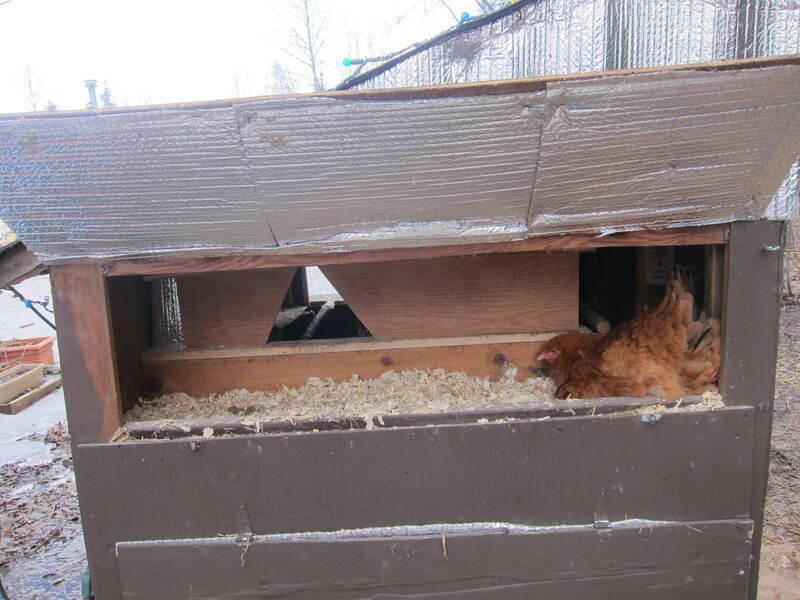 Being the resourceful woman she is, Beth built the entire coop herself for about $50. Most of the wood and siding was donated by contractors doing home remodels. She found tools at a garage sale for a steal. The paint and roofing shingles she found on Craigslist. Each part of Beth’s coop has its own story. The coop opens from three sides. One of the longer sides has a chicken-sized entryway cut out. The side facing us in the photo above has a shoulder-height door that opens for easy coop cleaning. 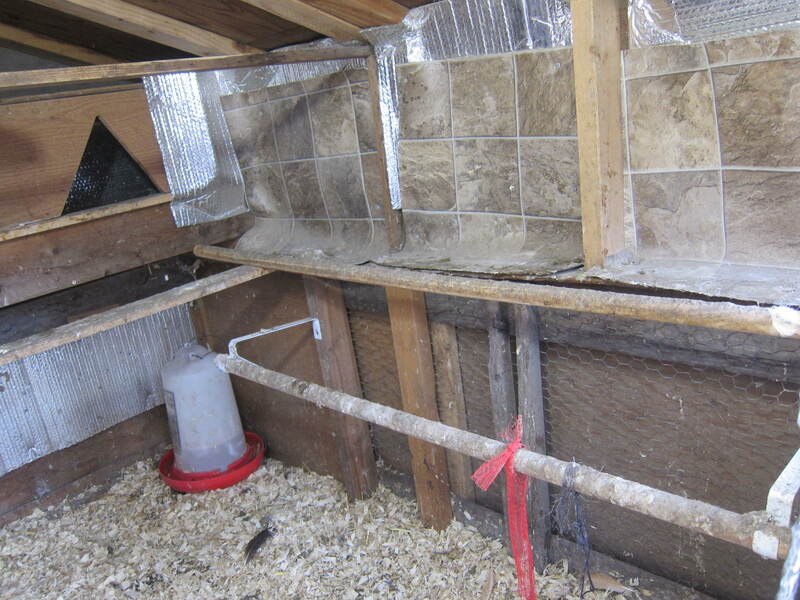 There are wooden roosting bars on either side of the coop, and Beth lined the top half of the walls with scrap linoleum. 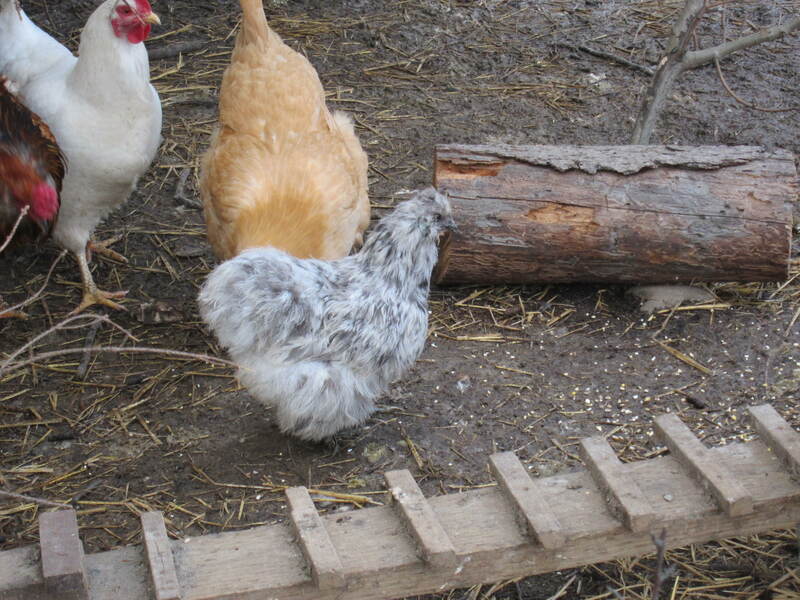 When she initially built the coop, the ledges under the top roosts were bare wood. 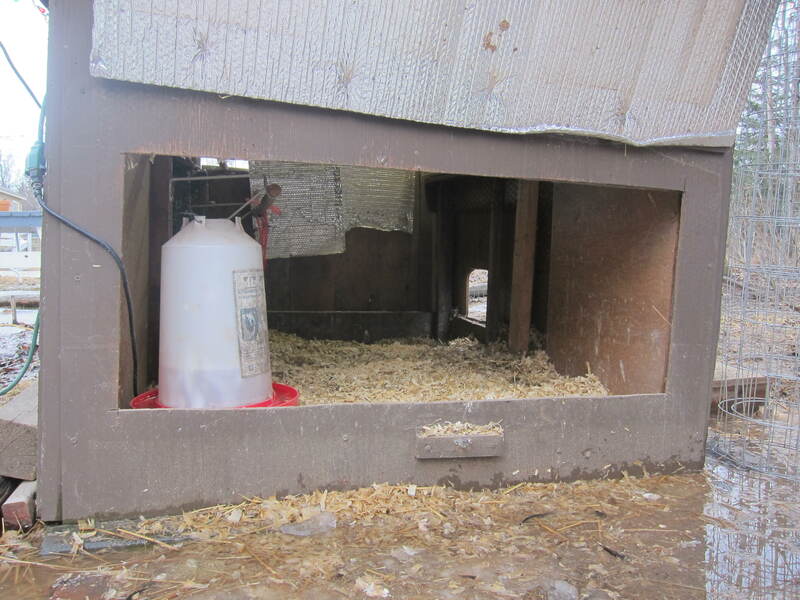 She soon tweaked her coop design to add strips of linoleum on the walls where poop would collect, making for easier cleaning under the taller roosts. As any chicken owner will tell you, when it comes to coop design and layout, keeping chickens is a long-term process of testing and tinkering to figure out what works best for your setup and your flock. Each backyard poultry owner’s space is unique, which is what makes looking at coops so much fun. 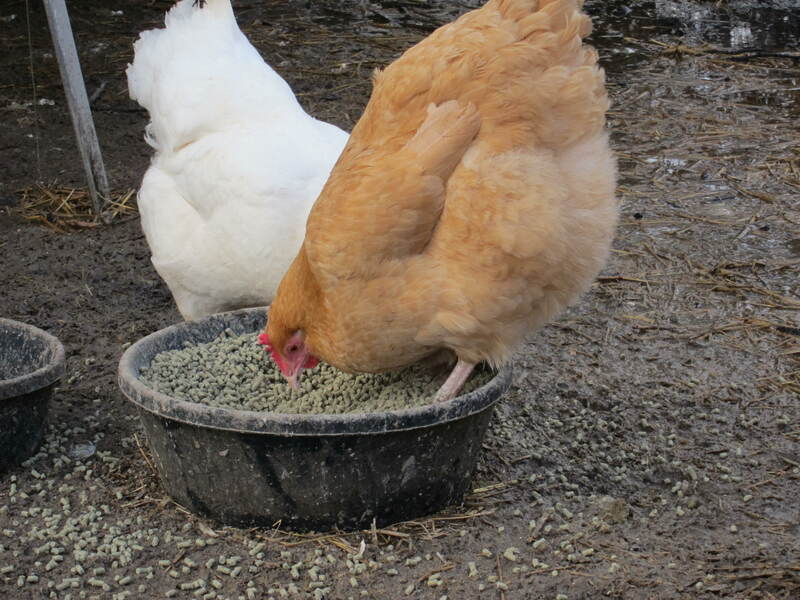 Beth keeps her hen’s water inside and the food outside, unless it’s especially rainy or snowy. 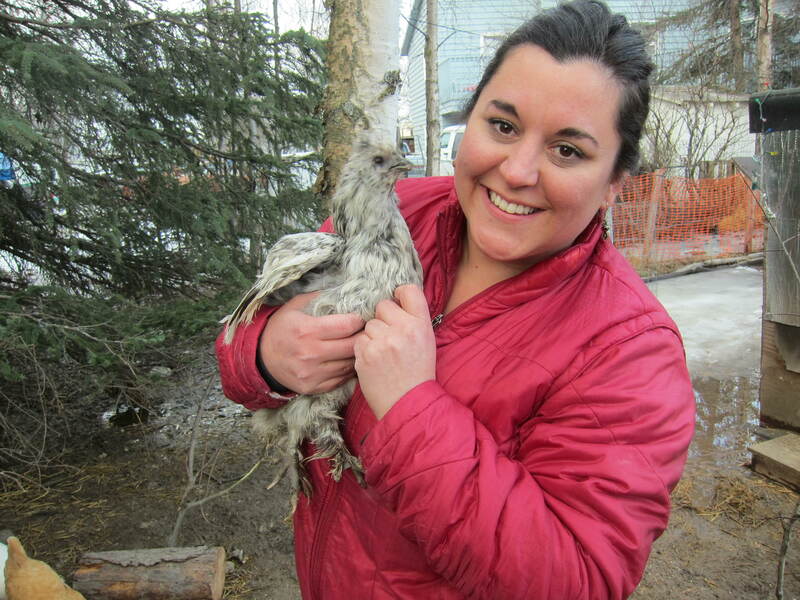 She’s been keeping backyard chickens in Anchorage for four years, and that system has worked well for her. On the coop wall opposite from the full door, Beth built a high opening and a lower opening. The bottom half of the same coop wall opens for easy water cleaning. In this photo below, you can also see the coop’s ground-level chicken entrance on the far right wall. The roofing of the coop is lined with house shingles Beth found, plus an adorable string of rainbow colored globe lights. She has a handy remote controlled LED light inside of the coop for her hens, but soon realized that when she’s inside her house pushing the power button on her remote, she can’t see whether she’s turning the light on or off! The solution? 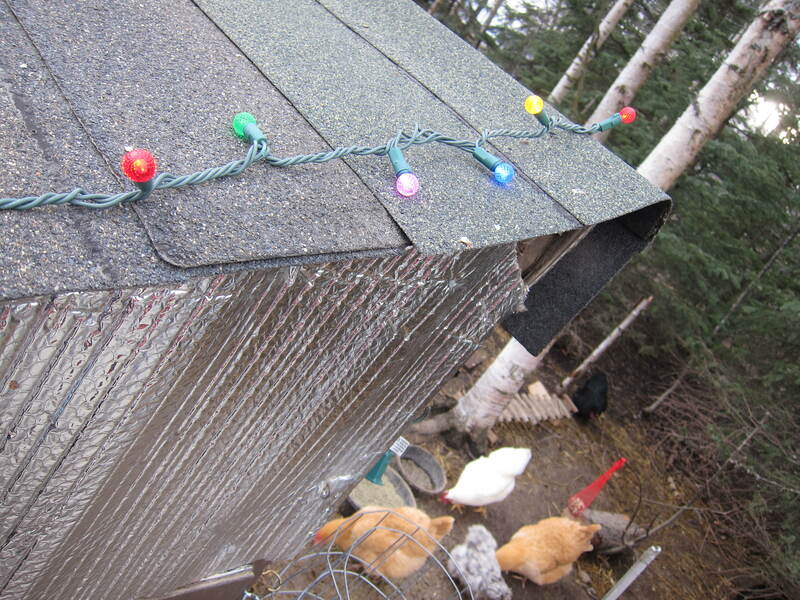 Adding a string of lights on the outside of the coop that are hooked up to the same power source. When the coop light is on, the string lights are also on. A very charming, yet practical, addition! 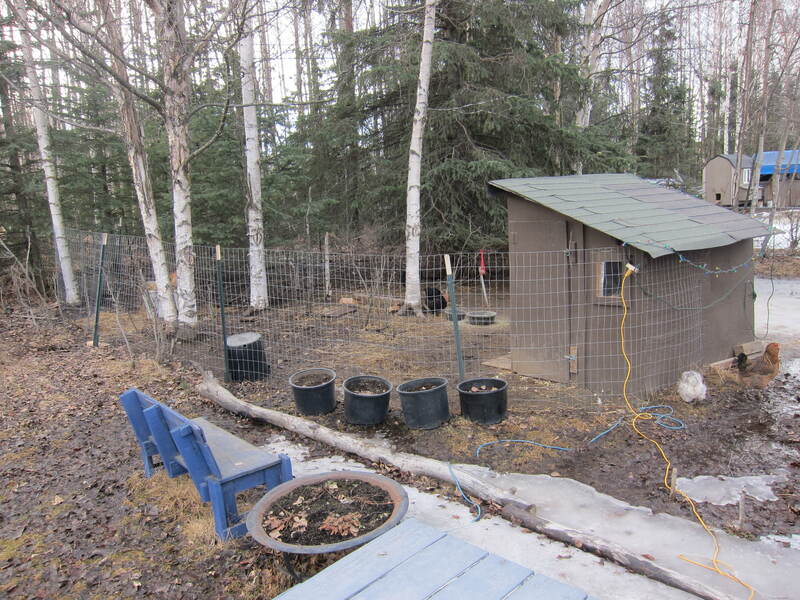 Beth has a chicken-friendly yard with her fencing enclosing a patch of evergreen and birch trees, offering her hens some outdoor protection from aerial predators, plus a fun weather-protected area to play. Her fencing is a large, open-topped area with an entrance near the coop, which she leaves open when she’s home to watch her chickens. Although their run area is very spacious, Beth’s sweet feathered ladies are often allowed to explore free range on her property, and they never wander too far off. 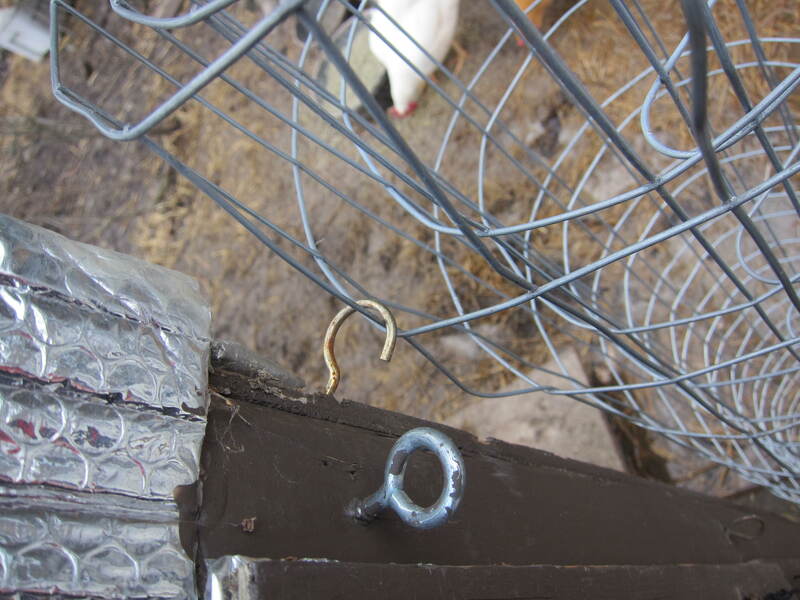 When it’s time to tuck the chickens in for the night, she rolls the fencing closed and latches it to hooks on the side of the coop. None of her hens have clipped wings, yet they’ve never attempted to get over the fencing. She’s never had an issue with her girls trying to escape. They’re all quite content with the size of their run area. With Beth’s run area full of trees, she’s come up with a simple yet brilliant boredom buster idea, which her hens love. 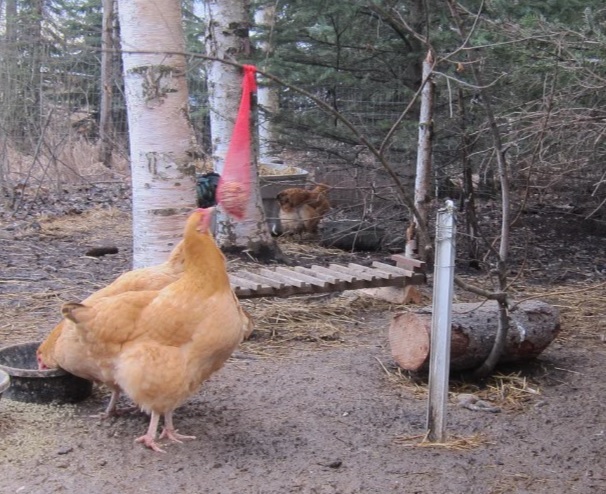 She fills a mesh bag with treats, then ties it to a bent sapling that hangs just out of the chicken’s reach. Years ago, before her coop was built, when Beth was still considering what kind of backyard animal would be best for her, she wanted something that could serve as both a pet and a constant source of food. She considered beekeeping and milk goats, but ultimately landed on chickens. It’s a decision she has never regretted. She has a friendly mixed flock of laying hens to give her fresh eggs, although she says her birds will still have a happy, long life living with her after their egg laying years have ended. 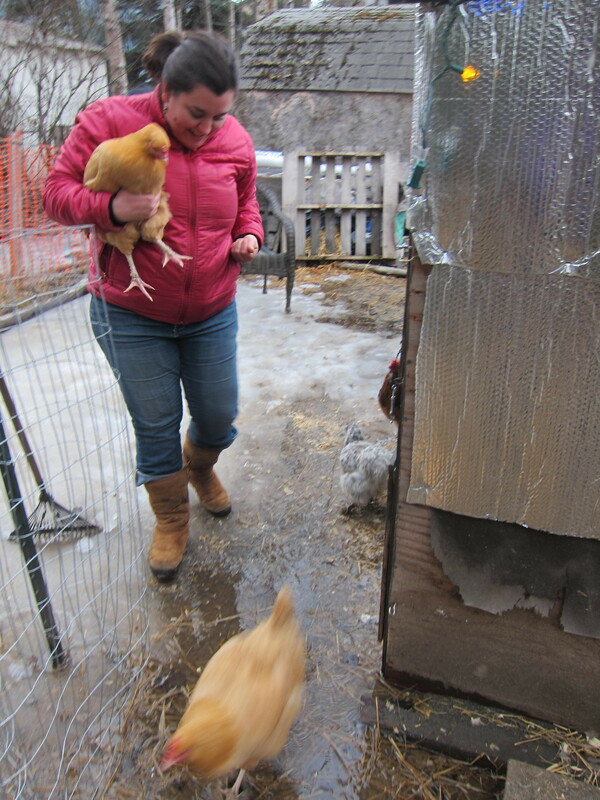 For Beth, her chickens are equal parts pets and producers. 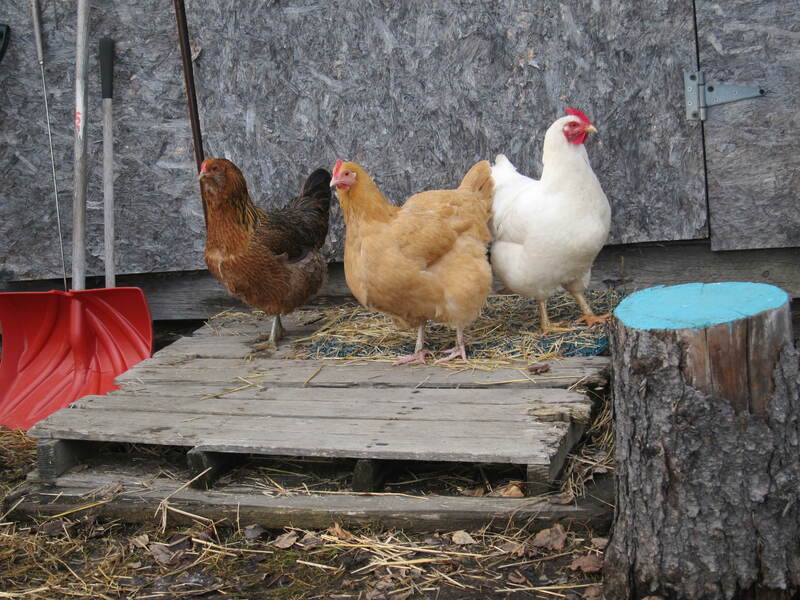 Beth’s hens are a mix of Buff Orpingtons, Easter Eggers, a Leghorn, and a few others. And who is the alpha hen at the top of the pecking order? A teeny, tiny fluffball Silkie named Momma. Momma was chatty, strutting around the yard, keeping the other hens aware of her presence. She’s the cutest little thing, and half the size of the other hens, but Momma commands serious respect from the other chickens. Chickens have the most interesting social structures. Here’s a photo of Beth holding Momma. Two of Beth’s neighbors also have chickens. 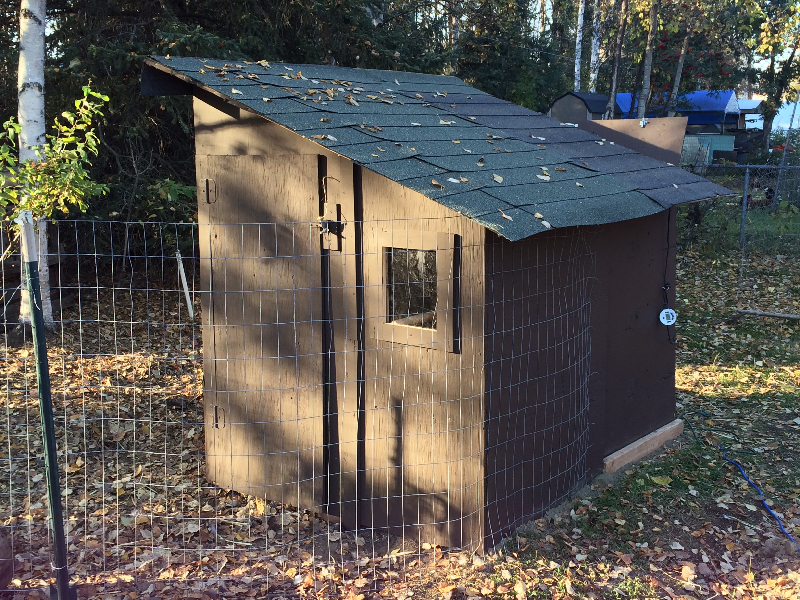 When Beth decided she was getting chickens, she mentioned it to the neighbor she shares a property line with, who thought it was such a good idea that he immediately put up his own coop, too! When one of the chicken-owning neighbors sees something suspicious in the area – like the owl who decided to take residence nearby for a few days last summer – they call each other and communicate. And when a chicken gets loose or lost, they’ve got a local support system in place to help each other out. It’s an urban chicken keeper’s dream! 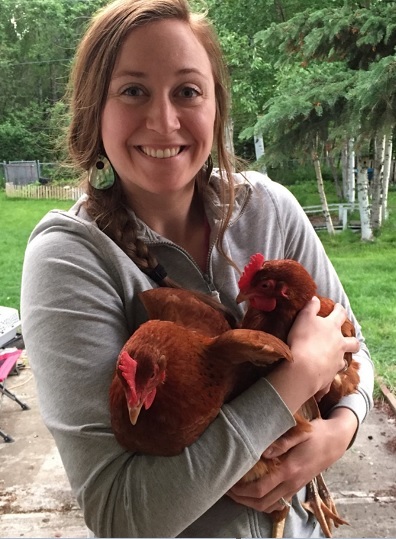 I’d like to give a HUGE thank you to Beth for letting me take photos of her backyard coop and her hens (especially in March – Alaska’s brown, mush season!). She has some of the happiest, most well cared for chickens I’ve ever had the pleasure of meeting. Beth is in a bear-free part of Anchorage, but Amanda isn’t as lucky. 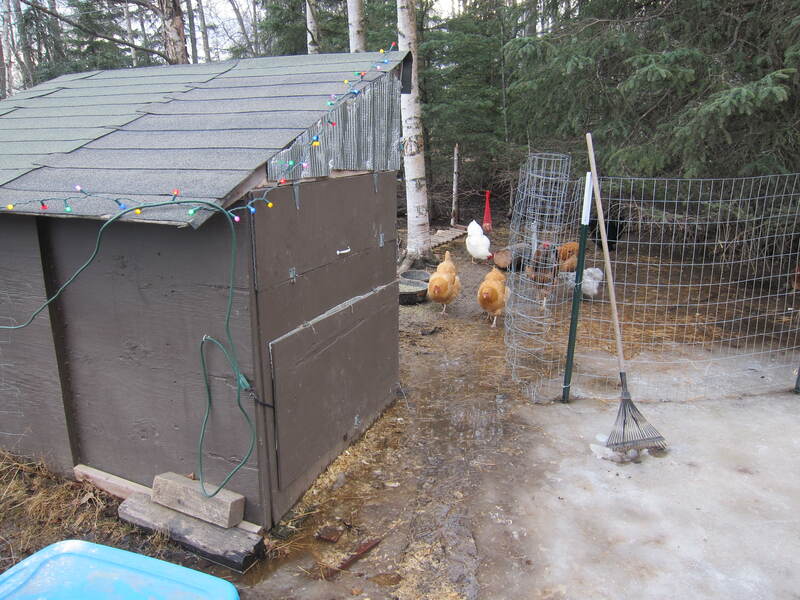 Check out Amanda’s coop here, complete with a bear-proof electrified fence. Nicely written piece about my awesome niece! Congratulations Beth! Good job Beth! Our coop was about the same price. 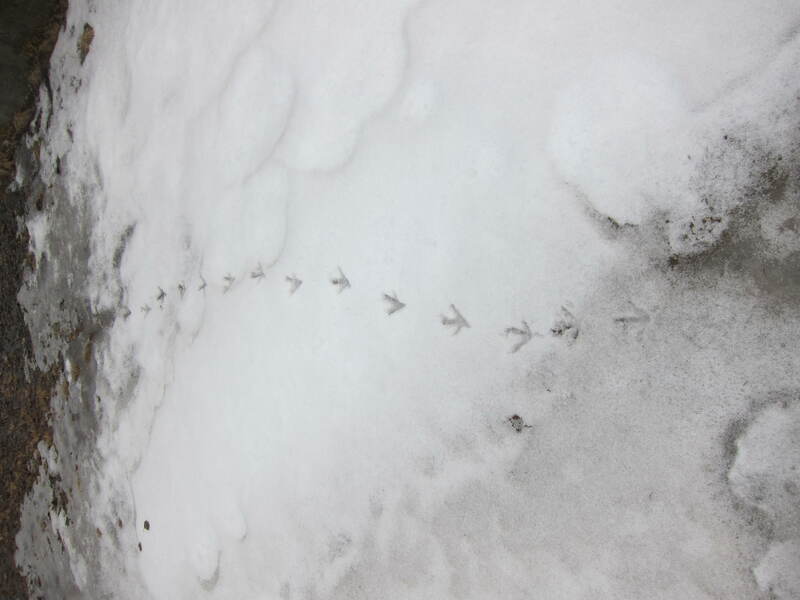 I love the picture of chicken tracks in the snow.